Happy anniversary to all current and former students, lectures and organisers of European Media and Communication Doctoral Summer School. We are deeply sad to inform that Klaus Arnold, founder and first Chair of the Communication History Section, has passed away. In this very sad moment we would like to thank Klaus for the many good things he did in his life and for bringing us all together through the Communication History Section which is one of his many legacies. New Section, Network and Temporary Working Group representatives have been elected to the ECREA Executive Board. It is with great pleasure that we announce the election of representatives of networks, sections and temporary working groups to the ECREA Executive Board. Tereza Pavlíčková is a PhD Candidate in Media Studies at Charles University in Prague and Vice-Chair of Young ECREA. Göran Bolin is Professor in Media & Communication Studies at Södertörn University, Stockholm, Sweden and Vice-Chair of the Mediatization section. Michael Harnischmacher works at the Centre for Media and Communication at the University of Passau, Germany, and chair of the ECREA Journalism & Communication Education TWG. Now available - UPDATED map of events taking place in 2017. We have prepared an overview of conferences and workshops, organized by ECREA Sections, Networks and Temporary Working Groups. Download NEW ECREA 2017 Event Map (PDF) here. The ECREA Young Scholars Network (YECREA) and ECREA invites applications for two grants for doctoral students participating in the ECREA European Media and Communication Doctoral Summer School 2017. The grants are intended to encourage and support PhD candidates with limited economic support and with limited opportunities to participate in international academic events. The grants will be awarded to two students who have applied and have been accepted to the summer school. If selected students are not members of ECREA through their institutions, the grant will also include one year free individual ECREA membership. *Please note that students who receive ECREA grants will not be eligible for travel refund from the Summer School organisers. 1. Student needs to complete online application to Summer School through http://ecreasummerschool.org/ by 1 April 2017. 2. Student need to submit a separate application for the grant by 1 April 2017. The grant application should include 1) application form and 2) motivation letter. Applicants are expected to complete and submit the application form in which they will be asked about their financial and institutional background as well as a motivation letter. You can download grant application here. In the motivation letter, students should especially specify the reasons for why they should be awarded a grant. The focus should be placed on the stability of the doctoral position (financial support, time given to complete the PhD, etc. ), the academic support (in terms of supervision and opportunities for structured feedback), international academic exposure, and all other topics that might seem relevant to the applicant. To apply, please send the completed form and motivation letter to info@ecrea.eu by 1 April 2017. For further questions, please use the same contact address. The selected applicants will be notified by 15 May 2017. If no grants will be awarded, the call may be repeated for students that were accepted to Summer School in late May 2017. The grants will be awarded based on a number of criteria. The primary aim is to make it possible for young scholars to participate in the summer school, who otherwise would not have the opportunity to participate in a similar event. Evaluations will especially assess applicants’ access to financial or institutional resources. Furthermore, it will be considered in how far an applicant has opportunities to received qualified feedback by high-profile researchers and peers in a way the summer school provides. A jury consisting of the YECREA management team and former Summer School students will carry out the selection process. Only applications of students, who were accepted to the Summer School will be processed. Incomplete applications will not be processed. The applicants will not be reviewed in terms of academic quality. We are happy to invite you to participate in the ECREA European Media and Communication Doctoral Summer School 2017 that will take place at Università Cattolica del Sacro Cuore, Milan, Italy, from July 24 to August 4, 2016 (12 days). The ECREA European Media and Communication Doctoral Summer School 2017 brings together members of the European research community to this summer school in order to debate contemporary issues in media, communication and cultural studies. The main emphasis of this summer school is not on a particular theme, but on providing structural and individuated PhD- support for young European scholars, through a variety of working forms, including feedback seminars, workshops, and lectures. The summer school aims to provide a supportive international setting where doctoral students can present their ongoing work, receive feedback on their PhD- projects from international experts and meet students and academics from other countries, establishing valuable contacts for the future. The total number of students will be limited to 44, half of them selected by the consortium members. The Università Cattolica del Sacro Cuore (Faculty of Political and Social Sciences) acknowledges the Summer School activities with 10 ECTS for the participation in the full programme (including the supplementary activities). Furthermore, six of the best students’ presentations and all abstracts of student projects will be published in the Summer School Book. The deadline for applications for the summer school is April 1, 2017. Applicants from consortium universities and from affiliated partners of the summer school must have their application approved by their institutional coordinators before submitting their application to the summer school. Also the applications from consortium university applicants must be received by the summer school before April 1, 2017. ECREA will be awarding two grants for participation at the Summer School. More information on the grants will be available at the ECREA website (http://www.ecrea.eu) after 20 February 2017. This grant programme will be managed by ECREA and not by the summer school organisers. When applying, each interested student is expected to fill out the application form on the Summer School website. Prior registration on the website is necessary (http://ecreasummerschool.org/registration.html). Uncompleted applications will not be eligible for the selection process. Applications can only be submitted via this website. The deadline for submitting the application is April 1, 2017, 23:59 hours (UTC +1). Notifications of acceptance will be sent before the end of April. 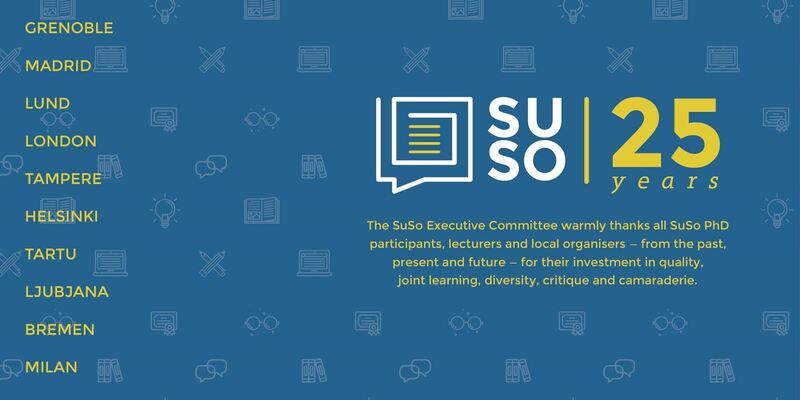 In respect of the selection of doctoral students from consortium universities, each one has appointed a summer school coordinator (http://ecreasummerschool.org/institutional- coordinators.html). The summer school coordinators are responsible for promoting the summer school within the consortium partner institution and to other academic institutions in their country. Consortium partner universities and departments are well-established and of best reputation in the field of media and communication, and have leading scholars in their faculties (see a list of previous lecturers http://ecreasummerschool.org/past-lecturers.html). All participating institutions of the summer school have experience in local, national and international cooperation. The departments have institutional contacts with higher education institutions within their own country and abroad, and well-established doctoral programmes. The consortium partner institutions and their summer school coordinators are fully autonomous in selecting their PhD student(s). ECREA is deeply concerned about continuing suppression of academic freedom and mounting pressures on autonomy of universities in Turkey. The actions against universities and academics in Turkey begun in the aftermath of the July 2016 failed military coup with forced resignations, large-scale firing of academics (including restrictions of their re-hiring), limiting the freedom of expression and movement and implementation of the ongoing climate of fear. Last week alone, 330 academics from 23 universities were fired, among them 16 staff members of University of Ankara Faculty of Communication, which has for example now lost 25 academic staff members since September 2016. The intervention also greatly affected students as many programs, courses and thesis supervisions can effectively no longer be continued. According to news and our sources, many of the fired academics were signatories of a 2016 petition ‘We will not be a party to this crime!’ which condemned military operations in Eastern Turkey while others were academics who criticized social, economic, political and cultural policies of the current government. ECREA strongly condemns this and other actions against Turkish academics. Suppression of intellectual freedoms and fundamental human rights, such as freedom of expression, cannot lead to building of democratic, just and prosperous societies. ECREA also condemns the fact that political action against lecturers results in damaging students who can under no circumstances be made responsible for actions or beliefs of their lecturers and supervisors. ECREA therefore calls upon Turkish authorities to nullify past decrees and acts of political discrimination against academics and refrain from further interventions which would limit academic freedoms and autonomy of universities and contribute to perpetuation of the climate of fear. In the light of this, ECREA would also like to express its continuous support to our Turkish members and colleagues. 5/ the modus operandi document, stipulating its internal rules (see also http://www.ecrea.eu for examples). An overview of ECREA’s rules on TWGs can be found in the ECREA Bylaws (especially Title IV), accessible online at: http://www.ecrea.eu/about/statutes#ECREABylaws. Proposals for new TWGs need to be sent to the ECREA section, TWG and network coordinator (by email) before 28 April 2017. The proposals will be evaluated by the ECREA Bureau and Board, after consultation with the existing ECREA Sections, TWGs and Networks. The approval procedure is expected to last 6 months. Proposals for new TWGs can be sent by e-mail (attachment in .rtf, .doc or .pdf format) to the ECREA Section, TWG and Network coordinator, John Downey, at sections@ecrea.eu. Questions related to the call can be sent to John Downey at sections@ecrea.eu and j.w.downey@lboro.ac.uk.